This is one of my favorite recipes. 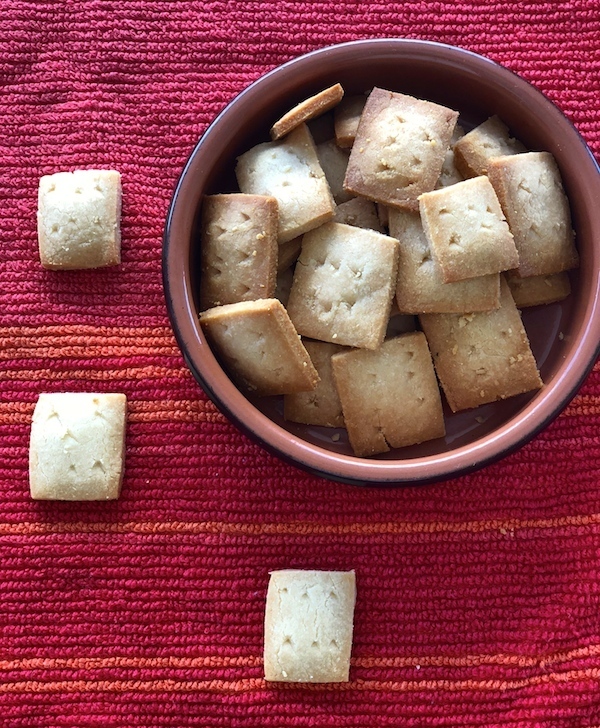 Amazingly wholesome and the best easy 2 ingredient Parmesan cheese crackers recipe you will ever try! Gluten free, paleo and keto friendly. 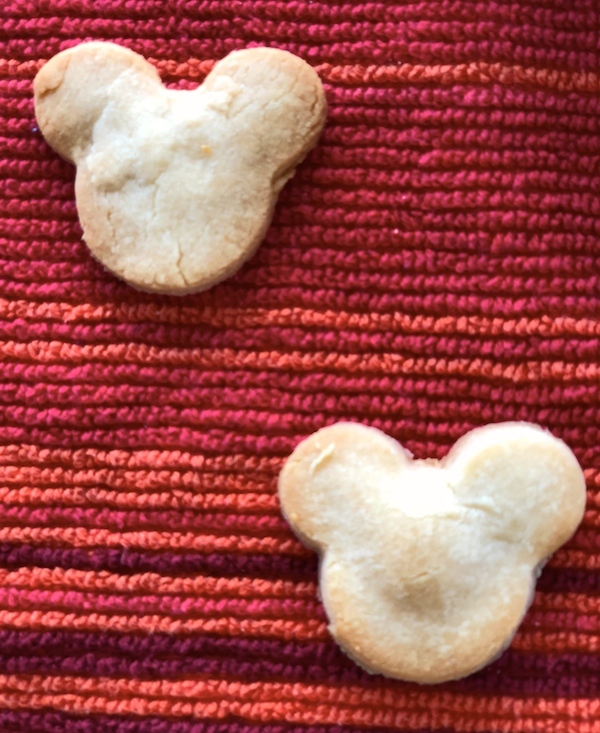 These crackers are great for kids and adults. A while ago I came up with a healthier version of goldfish crackers for my kids. I tried using different types of cheeses and flours. I experimented with different spices, different baking temperatures, and different molds. What was always constant was the fact that my family LOVED the cheese crackers. They enjoyed all the different varieties and flavors. They just loved the taste of homemade crackers coming right out of the oven. I mean, who wouldn’t? But one day, I made this recipe using Parmesan cheese and had a glass of red wine while eating them. In that moment, I realized this was the best easy 2 ingredient Parmesan cheese crackers ever. I was in heaven! Really, it is the perfect combination! Best Tasting Gluten Free Parmesan Cheese Crackers Ever! This is why I decided to share this amazing idea with you. They are really the best crackers ever! Fancy tasting Parmesan cheese crackers for the entire family to enjoy. Let the kids have them as a snack, and we can have them with a good glass of wine. 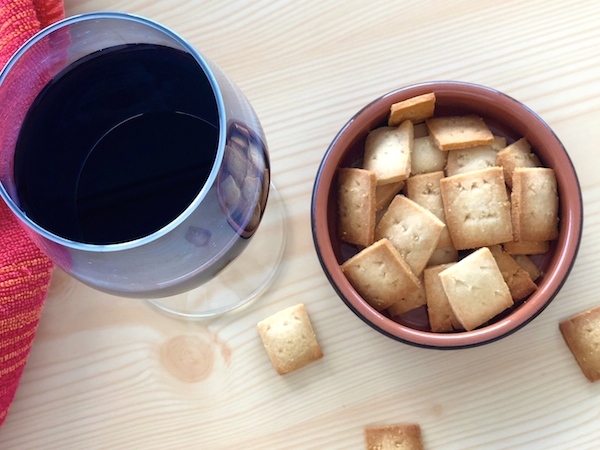 After a long day, this is the perfect time for some wine and cheese crackers. Everyone wins with this recipe. 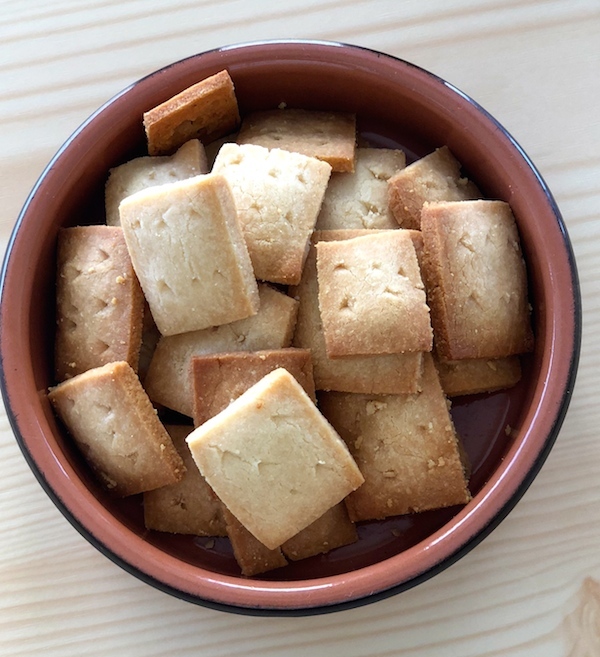 The crackers have that unique homemade taste, full of Parmesan cheese and almond flavors. Fancy looking and tasting crackers that will impress anyone who tries them. The best part is they are super easy to make using only 2 healthy ingredients. You can grate the cheese yourself or buy it already grated. Make sure you choose a good quality Parmesan cheese and almond flour. You also need parchment paper, a rolling pin (or a bottle if you don’t have one), and some cutters (I used a Mickey cutter ) for the kids if you want to make them more fun. Use equal amounts of Parmesan cheese and almond flour. That’s it! 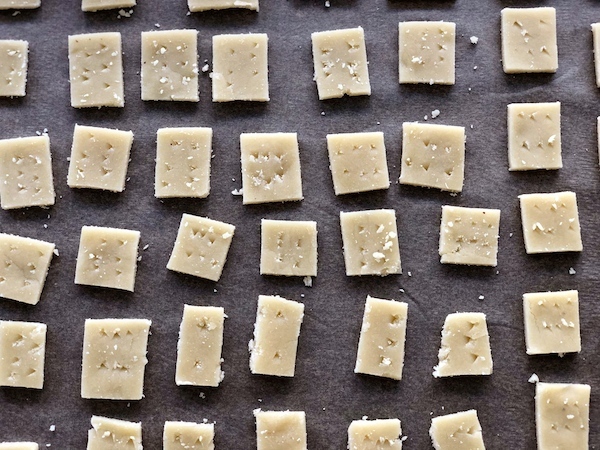 This recipe will make about 50-60 small crackers. Go ahead, give this recipe a try and see for yourself. You can make a big batch and freeze them for later too. Your kids will love them and you will enjoy the best tasting cheese crackers you could ever find. 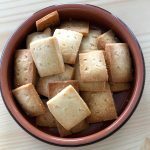 Super easy 2 ingredient best Parmesan cheese crackers. Gluten free, grain free, no sugar. Take the dough out of the food processor and form a big ball with your hands to. The dough generally comes out fine and forms well. *You may need to add a little bit of water (just a few drops) if your dough is not well formed. Roll out dough on top of Parchment Paper. You don’t want it too thin because the crackers could break easily. Cut in fun shapes with your favorite cookie cutters or if you don’t have any, just cut in little squares with a knife. I made mine with little holes just for decoration. Place them on a baking sheet on top of parchment paper. They don’t stick so no need to use oil or butter. Bake for about 10-12 minutes until golden brown. Mine came out just perfect in 10 minutes. If you are interested, please check out my recipes for easy to make, healthy, and homemade family meals. I am not a chef or have many years of experience cooking, so most of my recipes are very easy to prepare. You can find me on Instagram @creativehealthyfamily. Oh Yum these look so good! Have you tried other nut flours? I also make them with whole wheat flour and other types of cheese. They are really good! They are amazing! Hope you try them soon! This is incredible! Thank you so much for sharing this! OH MY GOSH! These look so yummy! I am definitely going to try out this recipe 🙂 Fantastic blog post! Give it a try and let me know ? I’ve always wanted to try crackers from scratch, but with three teenage boys in the house I’m not sure they’d last long enough to be worth the effort. Thanks for sharing your recipe. Sounds delicious! I never thought parmesan and almond flour would make a complete cracker, but they look brilliant! These are so good. Many of my keto baked items turn out to be huge failures so I only made half a batch. I wish I had made the full recipe.These are so good I will be making more soon! Can you use other kinds cheese or sure this work because of the fact the parmesan is a hard cheese? Thank you. So happy to know you liked the recipe. Yes, I’ve tried gouda cheese and they crackers came out delicious as well. Aren’t they amazing? And the best part is they are so easy to make. These crackers are just so easy to make and are low carb and healthy deliciousness! Ursula has such wonderful and healthy recipes that I want to try them all! Just made these tonight and they are great! The crackers I made even look like the picture. I used 1/2 cup parmesan cheese and 1/2 cup cheddar and they are great! I’ll be enjoying these with my keto taco soup I made today too. Thanks for sharing the recipe. So glad to know you liked the recipe. I love these cheese crackers! Just made these! THEY ARE ADDICTING!! sssooo delish and totally acceptable for a low carb way of eating thank you so much for sharing! I know right? Every time I make them I feel the same way. They are so delicious! Thank you for your comment. Thank you. These crackers are the best! Am I missing something? How did you get yours to form a ball? I used Kraft grated Parmesan. Do you freshly grate the cheese? It was just a pile of dryish powder. I added some water and spray oil to make it form up. Otherwise, they were tasty once I managed to get them baked. Hi, I freshly grate the cheese and the texture is very moist. I am thinking the Kraft grated Parmesan was very dry and this is the reason why you could not get a ball to form. Try grating your cheese next time and see how it goes. Hope this helps. WOW, these are so good and so simple! Thank you so much for the recipe! Next time I’ll try them with some cracked black pepper. Mine might have been a bit too thick; it took longer than 12 minutes but they still crisped up and got golden brown. This is a keeper for sure!! So happy to know you liked the recipe. Thanks. Thank you for your comment. Mexican queso? Wow! Good to know it worked, sounds delicious! So I came across this on Pinterest and am definitely making these tonight! Can anyone tell me how long they stay fresh for like in a sealed container? I made mine with fresh grated Parmesan cheese and coconut flour. They were a complete fail 🙁 I had to keep adding water to get it to kinda form a ball. Trying to roll it out was awful as well and when I tried them they turned to powder in my mouth. Has anyone had success with coconut flour? Oh no! I’m so sorry! Coconut flour won’t work for this recipe. Wow – mine were an epic fail too! Would love to know what I did wrong – used good quality cheese and almond meal, grated the cheese myself. Never really formed a dough. Instead of 60 cute little crackers, I got 30 blobs of cheesy almond meal. Not exactly what I was hoping for! Oh no! So sorry! Did you try maybe adding a few drops of water to form the dough? What type of cheese did you use? Gouda and Parmesan work really well. You should be able to see it in the nutrition information at the end of the recipe. Thanks.